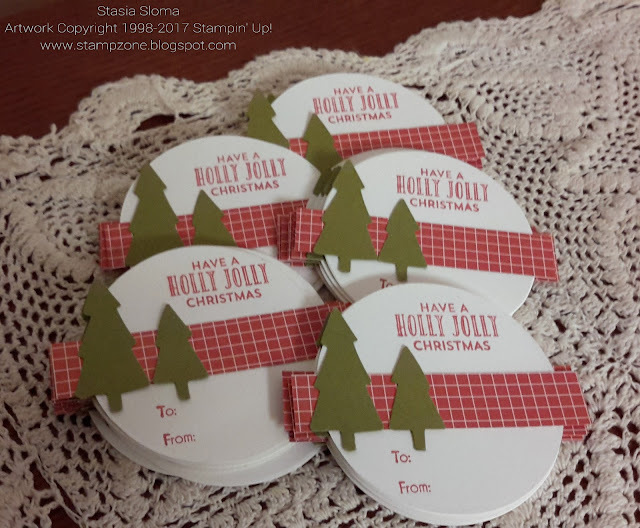 So for me it is a sin to buy Christmas Tags in the store when I have a tons of stamps and paper. How can I justify my stash if I can't even make a quick tag. The challenge is coming up with a quick tag. I was happy when I met the challenge. This tag was the easiest thing ever. The hardest part was punching out the trees. I diecut the circles with the retired Circle Sizzex. One of the reasons I will not get rid of my old sizzex dies, you can die cut more than one image at a time. I think you can get at least 4 circles diecut at a time and no frayed edges like can get with a punch cut out sometimes. The trees come from the Fiskars punch. The sentiment from the retired Stitched with Cheer. Tags and Trimmings gave me the to from. The strip of designer series paper is from Simple Stories Summer Vibes.